I am a professional organizer in Portland, Oregon, and I just wanted to second the mention of Brandie Kajino for all your tech organizing needs. I’ve known her for awhile and I can honestly say she is brilliant at what she does and so easy to work with. Excellent post, Erin. This is a great idea. Another service-related gift would be a gift of professional housecleaning. In my circle of friends this would be a much appreciated service, especially if EcoMaids or another green cleaning service were enlisted. BTW, I got the Fujitsu ScanSnap and love it. Great post Erin and so timely! 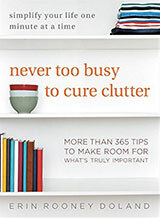 I think a professional organizer is a great idea and I’m person who is tempted to give myself this gift. LOL! I feel like once I get one place, or one aspect, in my life together then another one pops up and it needs help. I was determinded this year to get my spare bedroom cleaned out and liveable and I did — at the expense of another empty I had so now I’m back in the same boat. Even my desk at work needs a professional organizer since I have at least 4 empty file boxes stacked as a table and maybe 4 more doing the same on the other side of the room. It’s gotten so bad that my co-workers sent me the link to a contest, “Pimp My Cube” (contestfactory.com/pmc), where the winning mess gets cleaned up and “pimped out.” In case I don’t win that, I’m seriously considering seeking professional help to get all my areas together — any Florida recommendations? Big congrats to all on the list – and killer idea there Erin! For those needing uncluttering down under, you will also find a NAPO member and founding AAPO member – moi! 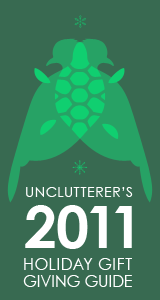 We’re celebrating ten years in Business in February and we looooooove to unclutter. Gift the gift of “un”!! Many thanks to the cool kids at Unclutterer for including us on this amazing list of organizers. DC represents! Thank you for having faith in our work! Erin, I love that you’ve selected the gift of working with a professional organizer as Unclutterer’s ultimate gift this year. Your advice of giving a few names of a POs to a gift recipient is terrific. Thank you so much for including me on your list of favorite organizers. Such wonderful organizers there. I’m so honored to be in their company! Oh my gosh Erin what a great and thoughtful post! You are right about being careful when giving our services! And most of all THANK YOU for including me on your list. I appreciate it so much. This business continues to gratify me, not only through my work with clients, but also in the amazing relationships I’ve developed with my colleagues. I am honored to be among such wonderful people on your list and in the industry in general! I am absolutely floored that you included me in this list. We are surrounded by some great people who work side by side with clients either in-person or virtually, help them develop goals, strategize, and implement life changes (and not just in the space). Erin is right, there is help in each and every city, ask the right questions and you will be shocked at how much you can accomplish with just a few changes under the leadership of a professional organizer. NAPO is your source for ideas and the consultant that fits your needs. Again, I am honored to get a mention and thank you! I’m honored and delighted to be on this list, especially among such remarkable colleagues. Erin, thank you for including me, and for being such a champion of the professional organizing community, and for sharing your expertise with your readership. Unclutterer rocks! How much should this ultimate gift cost? Love the idea for my sis in Las Vegas who would really like some help. Any pro organizers in the Las Vegas area to recommend??? Thanks and Happy Holidays! To answer your question about cost, David, Professional Organizers’ fees may be based on an hourly, daily or project rate and can vary widely depending on where the recipient of the gift lives, what kind of organizing service(s) are needed and the amount of experience the Organizer has. The best way to determine what a gift of organizing services is likely to cost is to contact some Professional Organizers who service the area where your recipient lives and discuss it directly with them. I suppose one would have to be choosy about who receives the gift. Some people would be a little put off by the “hint” that they’re messy!But for those who appreciate it, how wonderful! 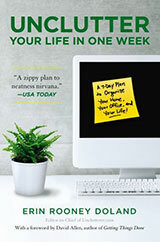 It makes me very merry to be included in this list of organizing experts.